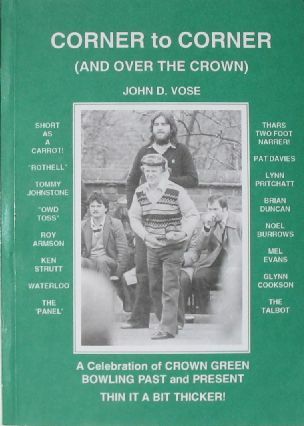 Synopsis The lusty game of crown green bowling has always had its fair share of salty characters. An earthy, gritty game spawned in the industrial north, claimed by many to be the second largest participant sport to angling, it burst from its restricting chains to proclaim its great appeal to tens of thousands of new admirers when it became a televised game. In Corner to Corner John Vose highlights the inherent colour and character of the game - the old professional 'Panel' with its hordes of punters; bookies shouting the odds; and banter and wit from the crowd as match-men try to outplay each other in gladiatorial arenas with big prize money at stake. Great bowlers from Albert Jackson to Brian Duncan are featured, as are pen-pictures of champions past and present (including the ladies). Numerous photographs of the stars of this vibrant game are included - the very essence of this exciting sport is crammed within the covers of this eminently readable book. John Vose's reportage on the sport ranges from graphically descriptive to outrageous fun, and the game is brought to life in all its glory. "I could do better with a pair o' black puddins!" Down to earth northerners roar out insults and 'advice'. The best bowlers are always watching as every competitor knows! *This ISBN, printed on the outside back cover, is incorrect as it consists of nine digits and not ten. According to the UK ISBN Agency, the ISBN registered for this book was 0-950-1036-08.